To find the dress of your dreams can take time and at Heritage Brides we like to give you our undivided attention. With an appointment you can try on our dresses in private - you will have the whole boutique to yourself and know that there will not be any interruptions. I'm not sure if you have any dresses which I like. The current styles we have in stock are all on this website but it really is worth seeing the dresses for real. We encourage brides to touch and feel because every dress is different. If you are still not sure then come along to the boutique for a browse and you can make your appointment then. What sizes do you have in stock? The majority of our gowns will be ordered in especially for each bride. During your appointment we will make sure that you are measured accurately and the right size ordered in for you. We have a range of sizes in the boutique so that you will be able to get an idea of how a style will look on. It depends which designer you have chosen, but as a rule of thumb your dress will be ready between 12 and 16 weeks after it is ordered. In some cases there will be a quicker turn around time, but this sometimes incurs an extra charge. If you need a dress at short notice, don't be afraid to ask, it might not be impossible! Do you do alterations at Heritage Brides? No. We have a number of local seamstresses which work with us and our brides. All of them have been making alterations to wedding dresses for many years and are highly recommended. Their details will be given to brides, should they need some alterations made, when they have picked up their dress. I have ordered a dress and have changed my mind. If you change your mind within 48 hours of ordering, then there is no problem. If you require a refund of your deposit this will be returned in the same way as it was paid. However if you change your mind after 48 hours, then the dress will already be in production and a refund of the deposit is not possible. If you change your mind and prefer a dress from the same designer, then this may be arranged. Can I buy a dress on the spot? If there is a dress at the boutique which you want and you are happy to take the display stock, then this is possible. Will the price in the boutique be the same as the one on the website? Yes. 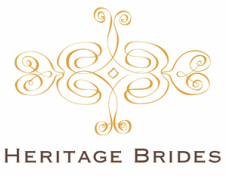 Heritage Brides likes to be transparent about how much our gowns, shoes and accessories cost. That's why we are one of the only boutiques to quote the price you will pay. We hope that we have a range of gowns in a range of prices which are suitable for all types of brides. Remember though that if you decide on extras such as belts or shrugs, then these will have a separate price which might not be quoted on the website.